The Holidays are Upon Us! Join me Dec 15 for a celebration! Join me at my studio on December 15 from 6-8 pm for a holiday art celebration! If you have ever wanted to hear my singing voice, that will be your golden opportunity! 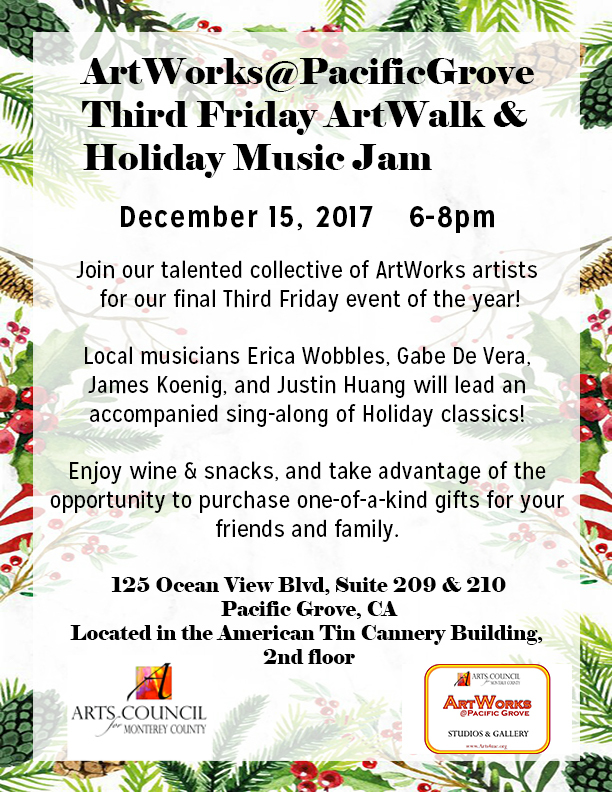 ArtWorks @ Pacific Grove Third Friday ArtWalk & Holiday Music Jam. Join our talented collective of ArtWorks artists for our final Third Friday event of the year! Local musicians Erica Wobbles, Gabe De Vera, James Koenig, and Justin Huang will lead an accompanied sing-along of Holiday classics! Enjoy wine & snacks, and take advantage of the opportunity to purchase one-of-a-kind gifts for your friends and family. 125 Ocean View Blvd, Suite 209 & 210, Pacific Grove, CA. Located in the American Tin Cannery Building, 2nd floor.